This year, 800 supernumerary seats have been created specifically for girls, following a directive of the HRD Ministry, with the objective of improving the gender balance in undergraduate programmes. Of the 18,138 candidates who cleared JEE-Advanced this year, only 2,176 were girls, which translates to 11%, or 1 girl for every 8 boys. This year, 800 supernumerary seats have been created specifically for girls, following a directive of the HRD Ministry, with the objective of improving the gender balance in undergraduate programmes. The disparity between boys and girls also shows in the list of toppers from region to region. Only one of the seven zonal toppers among girls is in the top 10 in the common rank list (CRL), and only one more is in the top 100. 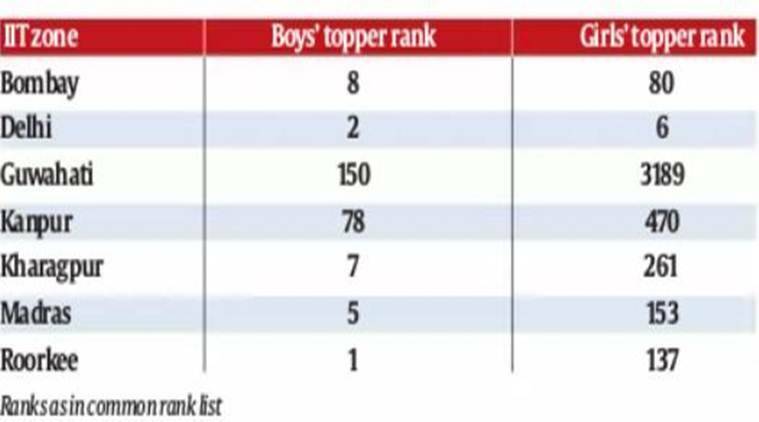 Out of the top 10 (both genders), five boys have topped their respective zones, besides the girls’ topper in Delhi zone (see chart). The 18,138 qualifiers, out of 1.55 lakh candidates, will compete for only 11,279 seats (besides the 800 supernumerary seats for girls). Last year, the lowest rank that earned admission to an IIT (5-year BA programme in architecture, IIT Roorkee) was 14,983 (CRL). The lowest rank that earned admission to an engineering programme in an IIT (5-year dual degree programme in pharmaceutical engineering & technology, IIT Varanasi) was 10,826 (CRL). The Level of carbon dioxide in the atmosphere, a key measure of how human activity is impacting the Earth, is growing at an alarming rate, the US National Oceanic and Atmospheric Administration (NOAA) has said in a recent announcement. The NOAA’s Mauna Loa Atmospheric Baseline Observatory has found that carbon dioxide levels averaged more than 410 parts per million (ppm) in April and May, growing steeply for the sixth consecutive year. 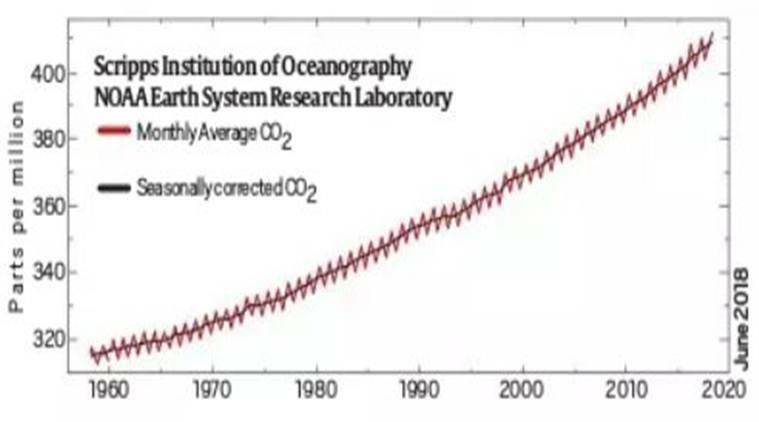 The graph shows how the carbon dioxide concentration has grown over the last six decades. According to Pieter Tans, the lead scientist at NOAA’s Global Greenhouse Gas Reference Network, the spike may be attributed to the “burning of coal, oil, and natural gas… at record high levels”. Carbon dioxide is one of the several greenhouse gases that are responsible for trapping heat in the atmosphere, to maintain the temperature suitable for life on earth. Carbon dioxide concentration in the atmosphere averaged about 280 ppm between about 10,000 years ago and the beginning of the Industrial Revolution in the mid-eighteenth century. As per the latest study, conducted in March this year, the concentration averaged around 408.75 ppm. Following the death of Sudan, the last male northern white rhinoceros, only two females of the species are alive, both in captivity. A team led by researchers at the San Diego Zoo Institute for Conservation Research has suggested a way to revive the species using cells preserved in the Frozen Zoo, a collection of cryopreserved samples at the San Diego Zoo. In a study published last month in Genome Research, the scientists sequenced the DNA of these cells and found that they hold a promising amount of genetic diversity for re-establishing a viable population of rhinos. They sequenced the genomes, compared them to the southern white rhino, and confirmed the long-held hypothesis that the two rhinos are subspecies, The New York Times reported. This might bode well for using southern white rhinos as surrogates for northern white embryos.